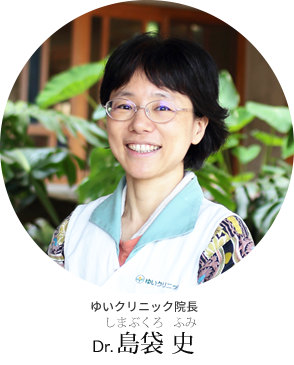 Director, Obstetrician & Gynecologist: Fumi Shimabukuro, M.D. Yui Clinic was Established in November, 2011. Hi, I am Dr. Shimabukuro, the director of the clinic. Having experienced childbirth and breastfeeding to four children of our own, we’ve decided to provide a place where the parent-child relationship is treated as one of the top priorities, and a place where giving a birth can be done while the family feel at home. which a big hospital do not provide. We believe that the mother who are giving a birth will have a better and secured feeling when she is taken good care of, and the delivery is done in a relaxing manner, and this environment provides different sense of security than the one that the big hospital gives. Considering the new born babies’ feeling, we thought that we should support a delivery where both the mother and child would feel comfortable. We wanted to provide the environment where they’d think “Oh, it’s not like a hospital. It’s more like our home!” That’s why we opened this small clinic which has only 5 beds total. This is what Yui Clinic is. Also, we want this place to be the one that supports the delivery and postnatal care that gives women an opportunity to grow meaningfully through the delivery, and to realize how cute little babies are and how joyous childcare can be. We closely hold the relationship with local community while communicating well with other neighboring hospitals. We will do the best we can to contribute to the mental and physical health of those who visit this clinic.